Ryan was absent from school a few days due to inflammation of his calves caused by viral infection. Instead of blowing time aimlessly at home, we decided to do something meaningful. 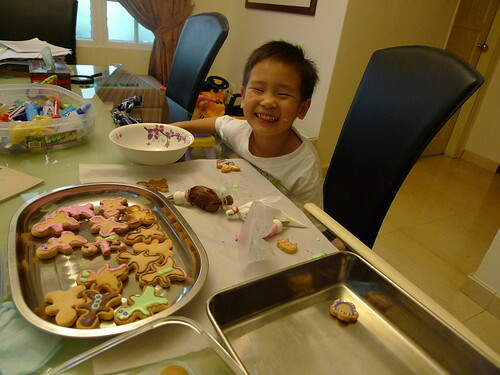 We explored a few options and finally decided we will bake some yummylicious butter cookies. I have never baked anything in my life. So instead of turning the kitchen into a disastrous war zone, I consulted my best friend for a sure win recipe. 1. Mix the flour, baking powder & salt in a bowl. 2. Cream the butter with sugar and vanilla until fluffy. 3. Beat in the egg and egg yolk. 4. Sift the flour mixture over the butter mixture. Combine with a wooden spoon until itâ€™s well combined and thereâ€™s no loose flour. 5. 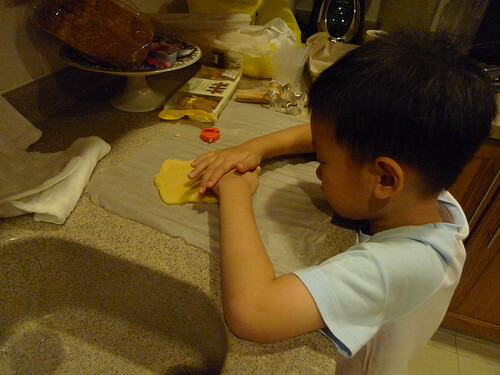 Roll the dough between baking paper into a rectangle about 1/8 or 1/4 inch thick. Refrigerate until cold. 6. 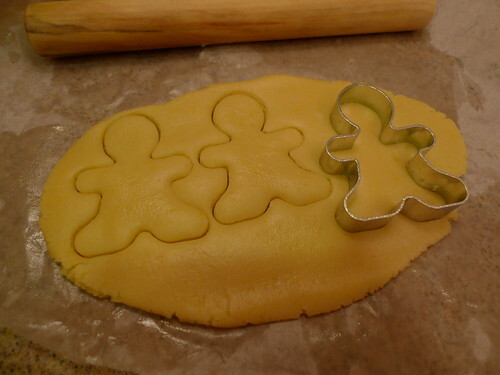 When dough is cold, cut it into desired shapes. 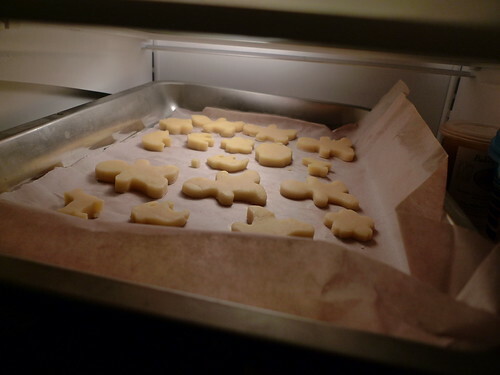 Put the biscuit on baking paper in a tray and refrigerate. 7. 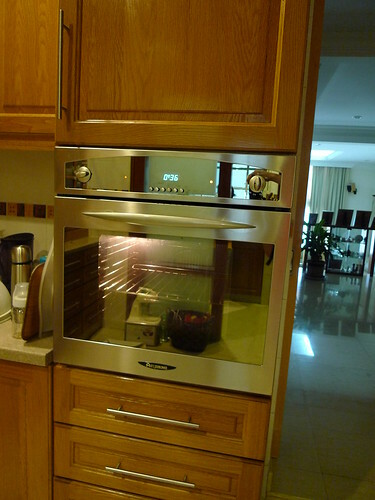 Preheat oven to 160C. 8. 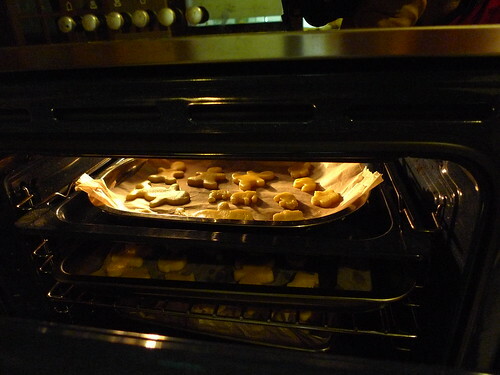 Bake biscuit for 15 to 20mins until very pale brown. 9. Let cool until set then transfer to wire rack. 1. Heat a pot of water on low heat. 2. Cut desired amount of chocolate into pieces and place in a bowl. 3. Put the bowl of chocolate into the pot of simmering water, and melt the chocolate. 4. Dip the cool biscuit (whole or partially) into the melted chocolate and leave the biscuit on wire rack or baking paper to allow the chocolate to harden before storing. The recipe is straight forward and easy to follow. I dashed to the nearby bakery shop to stockÂ in all the ingredients. Meanwhile, I got Loida to help get all the tools ready, the scale, mixer, ingredients, cutters, baking tray, etc etc. On 21 June 2011,Â RyanÂ was still limping butÂ handsÂ were sure fine. 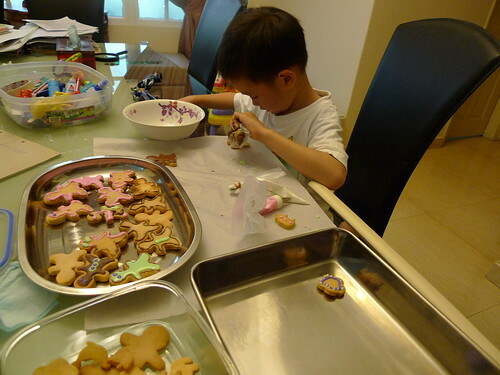 I got him to help out with the mixer, rolling the dough, cutting the shapes out..
At about 4pm, we were done with all the cookies. The kitchen was in a mess and I was too tired to work on the royal icing after baking all the cookies. We shall reserve the task for tomorrow. The next day… we worked on the royal icing. I had been prewarned of the complexity of reaching the right consistency for piping/flooding so I made an effort to read a bit on the topic prior this. The preparation was more taxing than I had anticipated as sure enough I had difficulty getting the icing runny enough for piping. It’s either it was too runny or too stiff. I guess the only way to perfect this skill is through lots and lots and I mean, LOTS of practise. It is definitely easier ‘read’ than ‘done’. 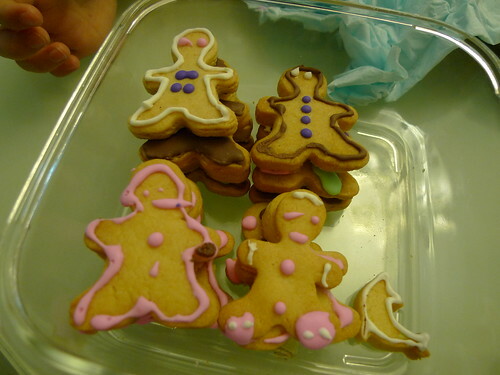 Flooding failed big time.. but they sure taste soooooooooooo gooood…. Ryan piped the eyes and mouth. So cute…. Ryan and I had a swell of a time and gives us ample bonding opportunity. 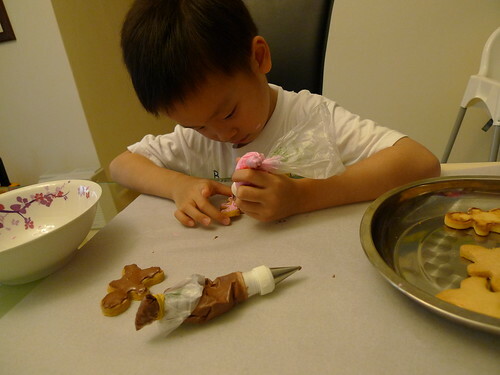 Later when I asked him if he wants to bake again, he said he shall only be tasked to do the decoration next time (royal icing). Just call for him when the cookies are ready to be decorated. LOL. 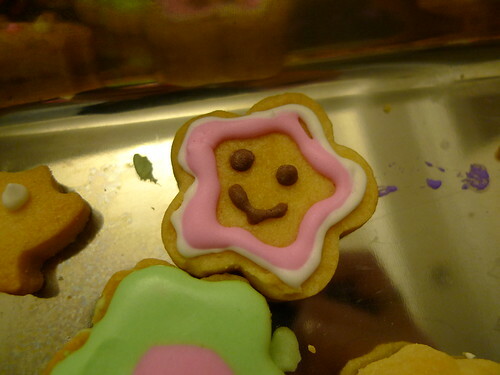 The cookies were yummy. 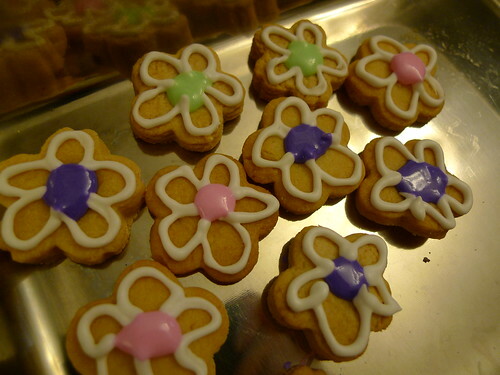 I guess butter cookies can hardly go wrong, even under the hands of someone who never baked her entire life. Even my maid asked for the recipe so she could bake them when she goes back to her Philippines. Just when things lookedÂ really memorable that day, we had a shock at night. I had turned on the monitor in the room when I heard Ryan tossing and turningÂ on the bed. I was in the next room watching my TVB show and decided to check on him. Sure enough, I saw him scratching frantically on both his legs.Â Under dim light, I thought I saw bumps thatÂ look likeÂ mosquito bites. I grabbed Bud’s First Aid Lotion (which really helps in reducing mozzie bit swell) and switched on the lights. I had a shock when I saw theÂ bumpsÂ on Ryan’s thighs. Those are no insect bites. I was in a state of shock I don’t even know what to think. My poor baby. Already he was limping due to the inflammation of his claves and now the painstaking itch. I ran to the first aid box andÂ dug out the hydrocortisone cream. Within half hour or so, the swelling reduced and he was no longer scratching. The next day, the swelling are gone. I showed Ryan the pictures we took of both his legs and he couldn’t believe it as there was no tell tale sign visible at all. 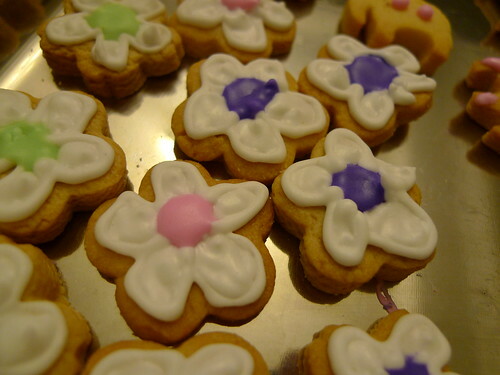 We are not sure of the cause of it but we suspect it could an allergy reactionÂ towards food coloring used for the royal icing. But then again, it’s not the first time he consumed food which may have hints of coloring and he has neverÂ experienced such reaction before.Â Could it have anything to do with his inflammation? It is surely on everyone’s guess. I hope it’s just a fluke incident. 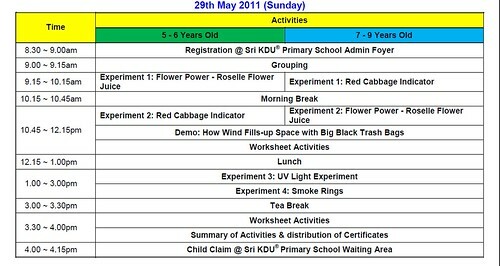 Ryan participated in a visit to the Kompleks Kraftangan Malaysia @ Jalan Conlay on 14 May 2011. This is not Ryan’s first excursion, he had been to similar trip back in October last year, a trip organised by Bao Bei to Kraf Tangan Negeri Sembilan, Yakult Factory as such. Having said so, this is his maiden trip inÂ a way because this isÂ his first trip without his parents around. I have no qualms about lettingÂ him go knowing he will definitely enjoy himself getting on a trip surrounded by friends and teachers. Furthermore,Â IÂ know he will be in good hands under the teachers’ care (They typically assign 1 teacher/helper to a max of 4 students). On the day, we dropped Ryan off at the school at 8.00am. 5 big buses parked in the school compound all ready for the kids to board on. I had a quick chatÂ with T. Annie and left not long after. I gave Ryan a hug and told him to have a good time. 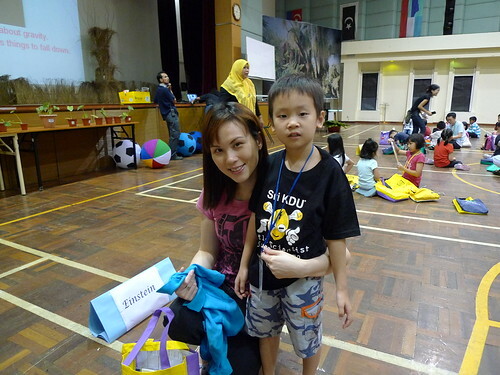 4 hours later, I was at the school to pick him up.Â Expectedly, he had a blast. 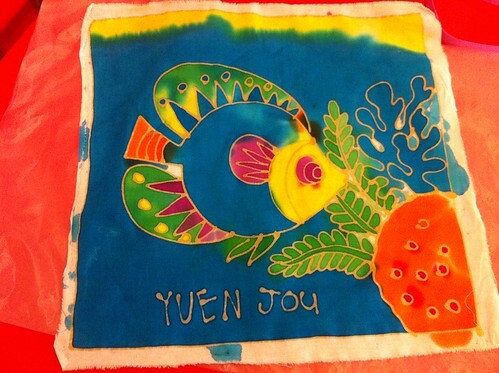 The conversation we had throughout the journey from school back to our home was all about his Batik printing activity.Â He was so proud of his masterpiece that he showed everyone in the house, including Siti. Taken 2 months ago with a bunch of cousins. 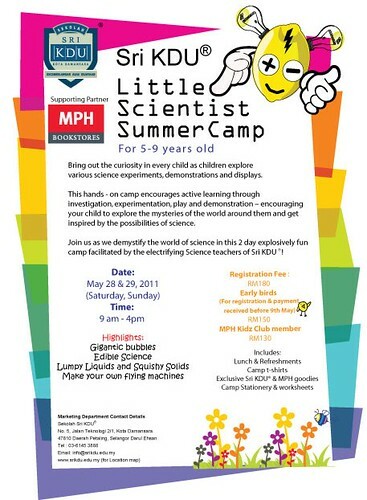 We enrolled Ryan into a 2 days holiday camp organised by Sri KDU during his May school holiday (RM150 early bird fee). Prior to that we had asked him if he’s keen after explaining to him the various activities involved. He was excited and gave us the green light to enrol. Nearer the day, I started to get cold feet. Suddenly I fear my little boy will be lonely, will be intidimated, will be this, will be that. I told hubby, perhaps we should pull him out. Afterall, it’s a long session from 9am – 4pm and he will be the only one there. Neither of his friends are interested. But hubby insist Ryan will be okay. I started to question myself, why the heck I enrolled him into something like this without any of his friends tagging along. The day came… 28th May. 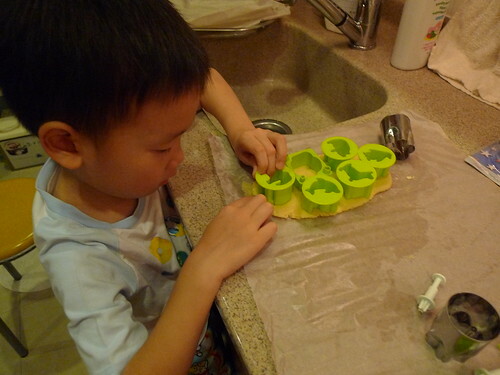 The night before I had showed him the videos on YouTube what are the science experiments that he will be experimenting. He seemed excited. He showed no sighs of pulling out; unlike his mommy. 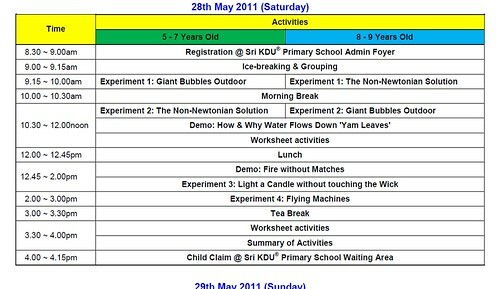 We reached Sri KDU around 8.30am. There were lots of kids and parents there. After registration we proceeded to the hall. Gosh.. Ryan looked really tiny there. Most of the kids are older than him but my litte boy was unfazed. He does looked a bit intidimated but still gave us the little smile when we waved goodbye. My boy, he has really grown. At the end of the first day we asked him if he had fun to which his reply was YESSS without hesitation. Phew…. That was certainly allowed me to let out a big sigh of relief. 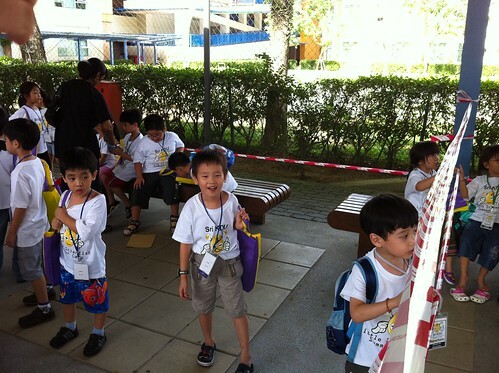 We made friends with the older boys in his group (Einstein Group). His best buddy for the day was this boy on the right name Ra Zer. I spoke to Ra Zor and asked him to look after Didi Ryan. Mommy has to do what a mommy has got to do. Hitting the 1.5 year old mark. Darren is now 18 months! In a blink of an eye, my little B is now 18 months. Boy, he has truly mature in the last few months. 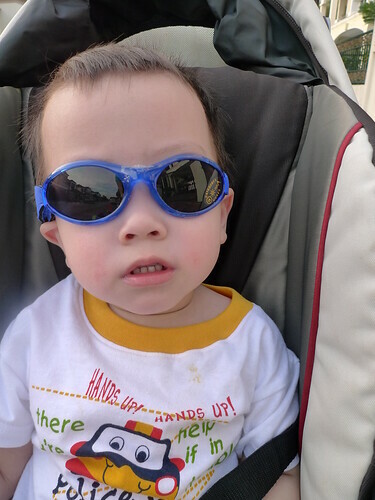 The last update I did on Darren was when he was a mere 15 months old tot. In the last 3 months, Darren has gone through a growth spurt. He really grow by leaps and bounds. From a little tot oblivious of his surroundings, suddenly he showed so much interest in our day to day activity. When he was about 16 months or so, he started following simpleÂ instructionsÂ from us. Simple things like ‘Take the paper and throw into the rubbish bin”, “Take the remote control and switch on the aircon”… He has no problem digesting all these instructions. His dexterity is good. He can ‘run’ around the house. after months of practising, I must say he could run pretty steadily now. Nonetheless, our heart still skip a beat whenever his running pace went beyond our tolerance level. Gosh, this boy can run! He’s such an energiner bunny which never runs out of batt. Lately, he discovered the joy of jumping on the bed after seeing how much fun the brother gets doing it. Just a couple of hours, he hit his face on the bed panel in the play roomÂ and bruised his cheek bone. He cried buckets. Hopefully he learn a lesson or two there, I hope. I noted Darren has like 12 teeth when he was 15 months. I seriously lost count how many teeth he has now. Probably the full set of 20 baby teeth, I need to confirm on that though as I’m not sure if the second molars are out. Nevertheless, I already started him on a proper oral hygiene. I uses the baby tooth brush (graduated from tooth wipes and finger tooth brush) with Earth Best Toddler ToothPaste which is safe to swallow. He absolutely love the taste of it. Lil B is also getting better at self feeding. Heâ€™s very interested in food, a true foodie. During meal times, heâ€™s given his bowl and spoon, filled with tiny bites of his food. He started doing that since he was 13 months. Now heâ€™s pretty much mastered the skill. Still pretty messy but heâ€™s getting there. Heâ€™ll be busy scooping and feeding himself away while Loida feeds him his food on the high chair. Hopefully by doing that consistently, he will learn to sit through his (our) meal; unlike his kor kor who is so spoilt when it comes to meal time (another post on that). After months of training, Darren is now a pro at self feeding. I’m so proud of my little boy. 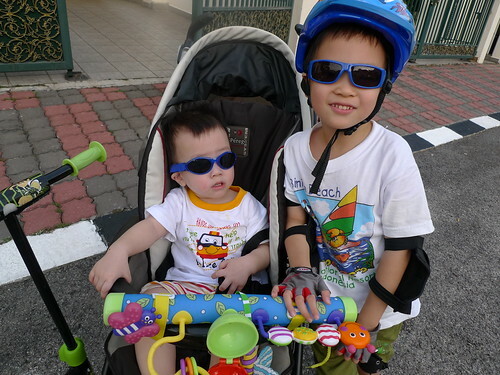 Compared to the elder brother, Darren is definitely more independant. 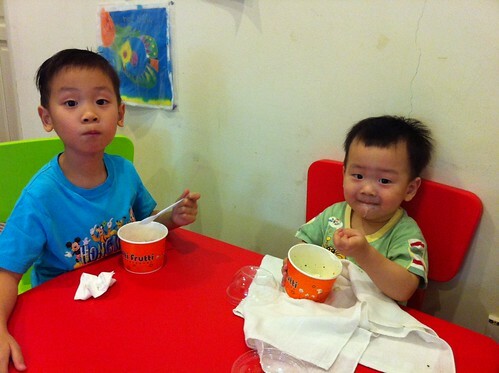 The elder brother was still fed during dinners until he was about 3. Darren’s sleeping pattern is pretty managable. His bed time pretty much depends on what time he wakes up from his afternoon nap. Nowadays I try to wake him up by 4.30pm so heÂ would be sleepy by 9pm. Otherwise, his bed time can drag till 10.30pm. Darren has no problem skipping his napÂ neither will heÂ show any crankiness. He’s such a joy to bring around. His waking hours can easily stretchedÂ 6-8 hours without him being cranky. It happened during our Phuket trip whereby he only took one nap in a day (around 12noon) and he was literally awake throughout the day until late at night (around 9pm) before he crashed and call it a day. 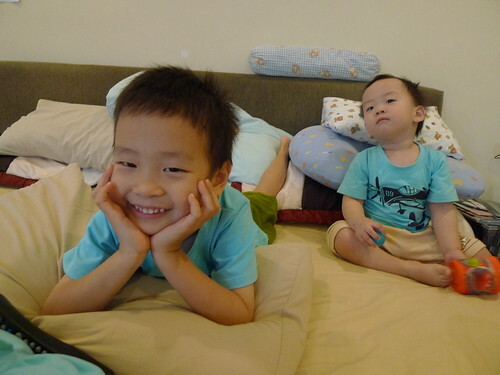 He is definitely much more managable than Ryan when the elder brother was at this age. 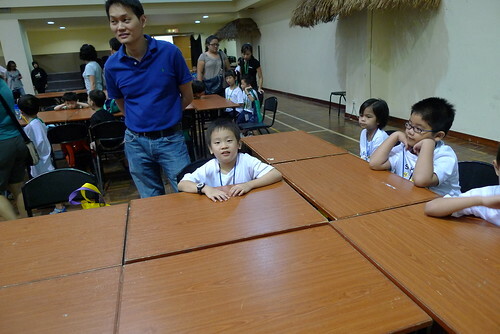 Darren is still attending Kindermusik Village Baby class. 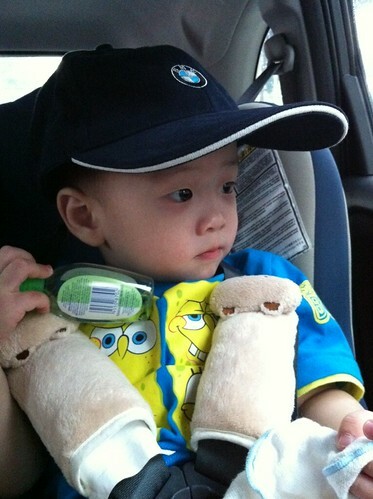 He is expected to graduate from the class and advance to Toddler class. 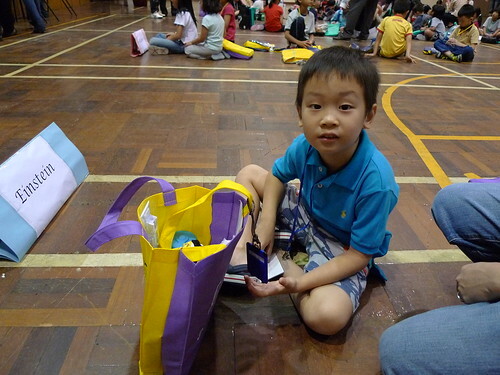 After one term, this term he showed more interest in the activities and increased participation. Lil B is a true foodie. He eats everything we eat, including Durian. 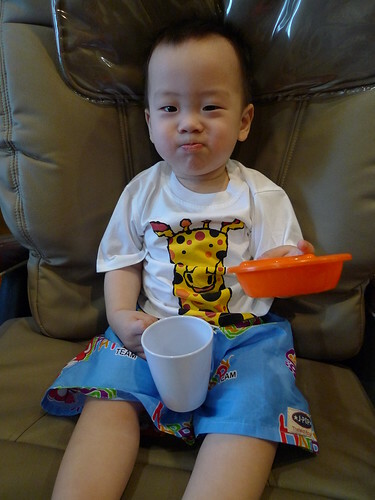 When we were in Phuket last week, we had no worries about his food. He’s definitely the opposite of Ryan. At home whenever he is hungry, he will make a fuss and pull me to the next room to the coner where the milk and bottles are kept. He will point to the milk indicating he wants milk. When I asked him, ‘Are you hungry? You want milk?”.. his standard answer will be ‘Y.E.A… After I’ve made him the milk, he will insist to hold the bottle and run next door showing off to his kor kor he’s got the milk. A really cute sight. This is the moment when I wish time can PAUSE. There are definitely more interaction with Darren nowadays. Our communication with this little boy is no longer a one way street. He showed us he could understand and comprehend what we were talking about, or want him to do. There is definitely more fun and noise in the house lately. - Darren also likes scribbling the paper with crayons, pencils etc, especially so when he sees his brother doing work at the desk. Judging from the frequency of himÂ prefering to useÂ his left handÂ on the activities (both fine and grossÂ motor skills, we are expecting another leftie in the family (Ryan is the other one). - Darren is a huge huge Barney aficionado. He loves Barney I Love You song. everytime he hears the song, his body will be swaying from left to right. The Barney plush toys we bought for Ryan last time (Ryan’s love for Barney was pretty short stint) which never really got appreciatedÂ can finallyÂ be handed down to a more appreciative owner. If weÂ pass him an iPad, he will tap on Youtube icon and run the Barney shows on it. Besides Youtube, his other favourite apps on iPad has to be Photobooth. In a nutshell, Darren is a very shy boy. Just the other day, his Kindermusik teacher wasÂ complimenting how sweet Darren is in class.Â She noted Darren is very gentle in class something which I noticed too. At times he will come to me, give me a hug and put his head on my shoulder.